We rented a car in Milan and drove it through the Friuli region but it’s still not easy to drive Italian rentals into Croatia. It’ll happen soon, but not yet. We had to drop off the rental in Piazzale Roma in Venice and get on the Ferry across to the Istrian Peninsula of Croatia. Not a problem at all. We parked the car in the rental return lot , got on the #2 vaporetto and rode three stops to the Ferry Boat Terminal at San Basilio. We parked the bags in the luggage hold (4€ each) and had a relaxing walk into the Dorsoduro Siestre. We’ve stayed in this area a few times and we always heard about the gondola repair shop somewhere near the Grand Canal. We’ve tried to find it a few times in the past, but this time we walked right by it. Everything comes if you wait long enough. It’s a relaxing 2.5 hr. 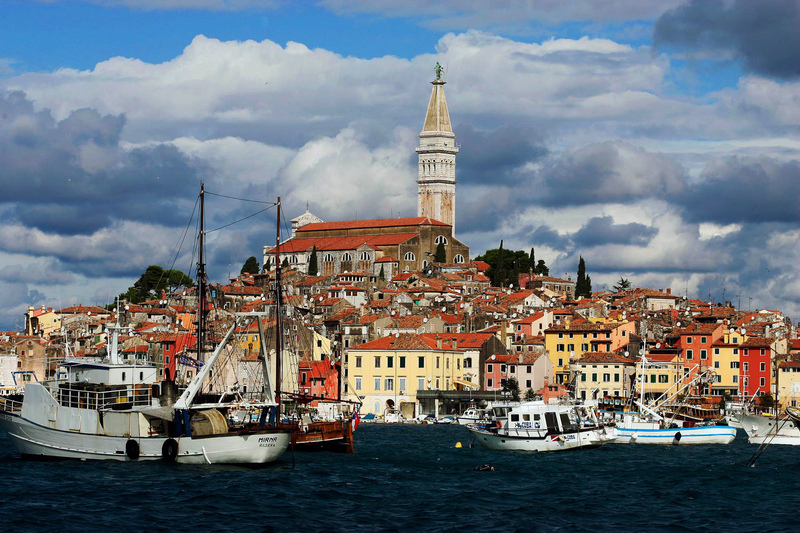 cruise across the Adriatic Sea to Porec(pronounced Porridge) on the northern part of the Istrian Penninsula. Between April and November, this town gets over 700,000 visitors per year. The vendors are happy and aggressive. You can’t walk by a restaurant or small shop without them trying to snare you in for a sale or a meal. Everyone offers the best price and all the prices are the same. Porec town still lives with the old Roman street grid, the Decumanus going East to West and the Cardo going North to South. If you can take your eyes out of the shop windows there are some really well preserved 13th and 14th century Venetian style Romanesque houses. 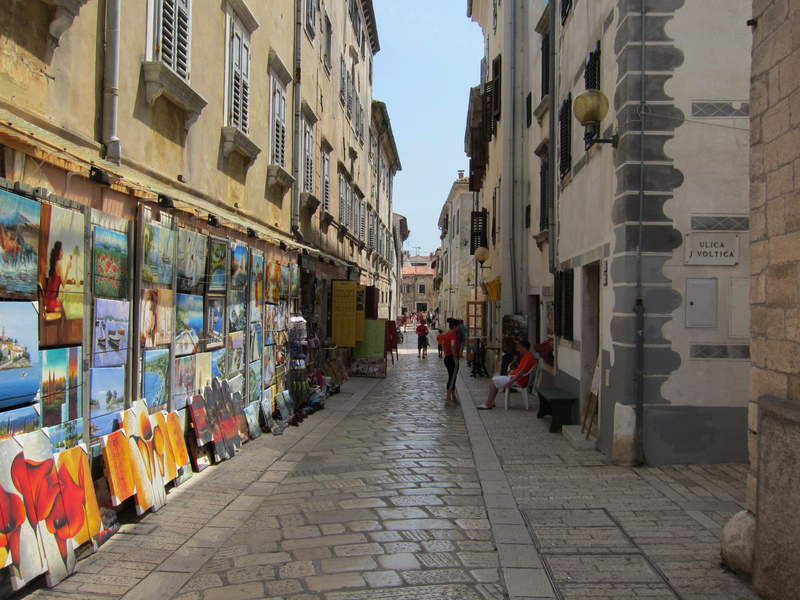 The streets are covered in large Croatian marble stone and both are crowded with jewelry, sunglasses, beachwear, handmade trinkets, art, fashion clothing, gelaterie and restaurants. We had a good meal at the Restaurant Cardo one block north of the main intersection of the two roads. The tables are set into a beautiful garden like terrace, the waiters are friendly (and not pushy) and the food is local, fresh and excellent. I highly recommend the scampi buzzara, a sauce of white wine, garlic and red pepper. It’s amazing. The big draw here, aside from the beautiful view of the Adriatic, is the Basilica of Euphrasius, named for the 6th century Bishop who created this Christian complex for the Emperor Justinian. Inside the Bishop’s complex are some great views from the Campanile and the 4th century mosaics in the Bishop’s Palace, including the famous toothed fish. 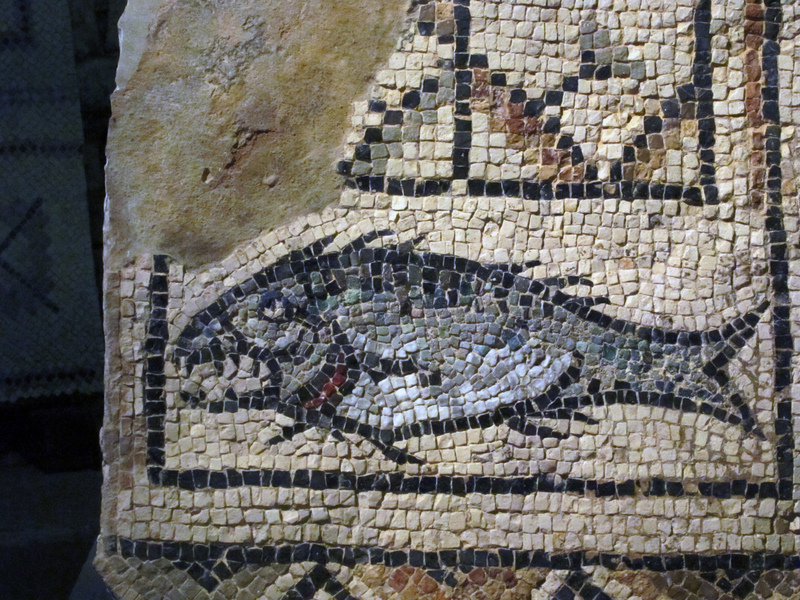 I know the fish is an early sign of Christianity but I have no idea why this one has teeth? It’s almost as if the these Christians were in a gang of toughies and their fish symbol had teeth, so beware. The toothed fish was so popular its been adopted as the symbol of the city. The 6th century mosaics from the Cathedral are definitely one of the best examples of Byzantine art we’ve seen, right up there with the mosaics of Ravenna. As the story goes, Euphrasius, so egotistically proud of his Cathedral, included himself in the Apse mosaic holding an image of his Basilica, standing adjacent to the Saints and the Virgin Mary. The Pope thought this so blasphemous, he, supposedly, excommunicated Euphrasius from the Church. But maybe he was reinstated. 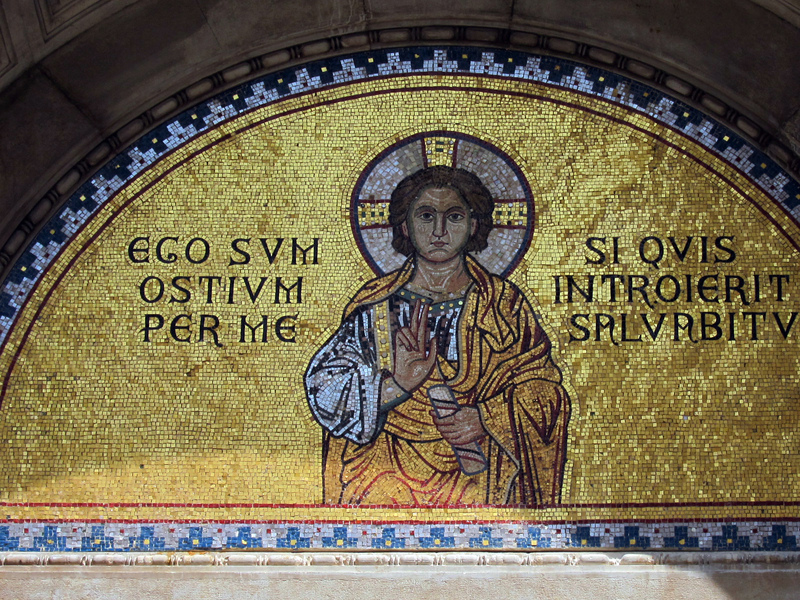 His mosaic portrait is still there and he is still revered by the city. Our hotel is directly in front of the harbor and we can sit on our balcony and watch the boats, and the people, come and go. It’s pretty relaxing for a tourist town filled with thousands of people. The town was supposedly founded by the Colchians who were pursuing Jason and the Argonauts after Jason stole the golden fleece from the land of Colchis (present day Georgia). 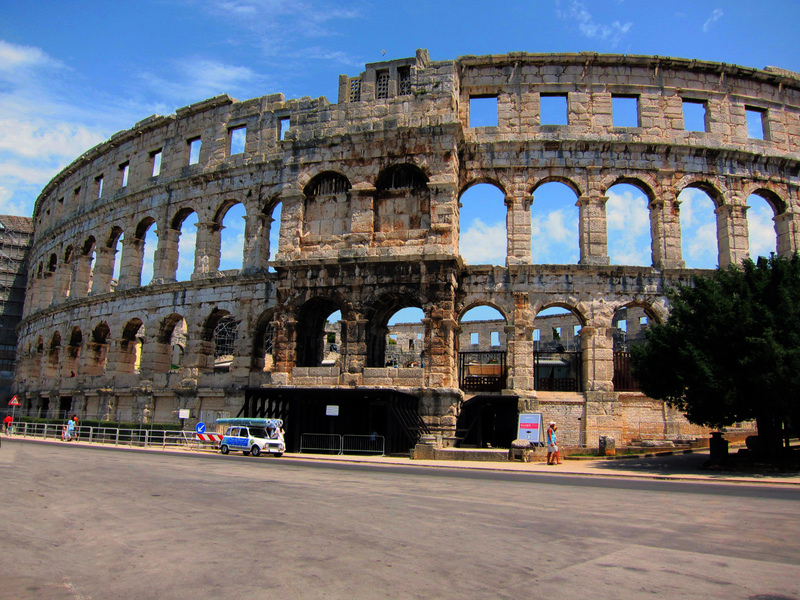 Pula is the location of one of the greatest Roman Amphitheaters in existence. As the story goes, Vespasian’s girlfriend Antonia Cenida was from Pula and somehow convinced the emperor to build a 23,000 seat amphitheater for a city of just 5,000. Vespasian was building the Amphitheatre in Rome (the Colosseum) at the same time so he just doubled his production efforts. Like all the other amphitheaters, once the gladiatorial games were outlawed by the Christian rule, the dismantling began and a lot of the grand building ended up in nearby houses and buildings. In the 16th century, the Venetians wanted to ship the entire amphitheater back to the mainland and reassemble it. It didn’t happen. By the 18th century a law went into effect to stop further removal of any more of the original building. During the Italian fascist rule there were a few more attempt to tear it down and reassemble it somewhere on the mainland of Italy. Once again, didn’t happen. These days it’s used for concerts and mostly for the annual summer film festival of Pula. 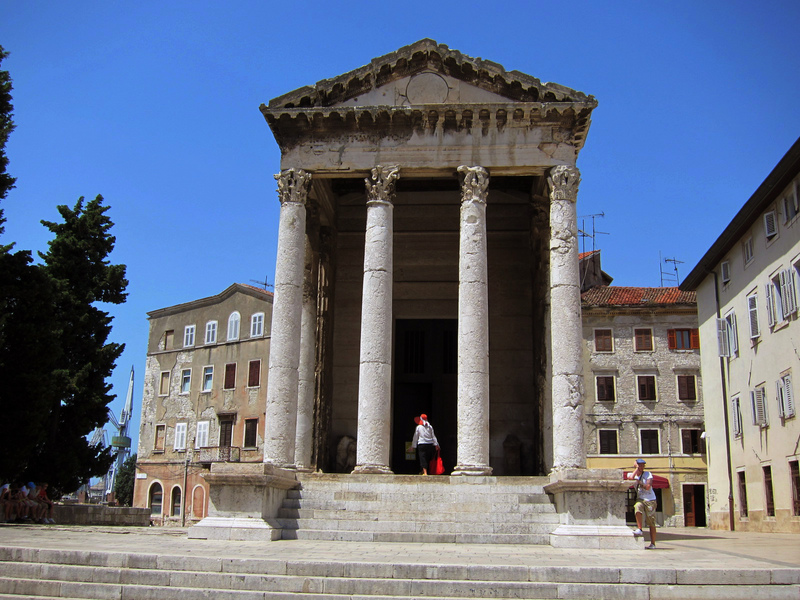 Pula has a few other worthwhile places to visit the old Roman city. The Temple of Augustus is the only great piece left from the Ancient Forum, although a lot of it was rebuilt after the bombing of 1945, it’s still very impressive. It now houses a Lapidarium , which we’ve learned is another word for ancient Roman sculpture and broken chards. 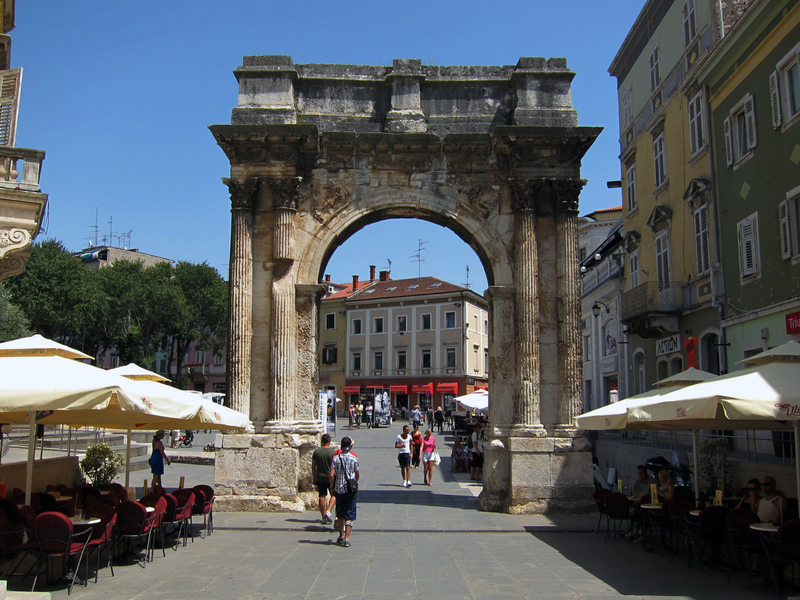 On the other side of the Forum, down a nice winding street is the Arch of the Sergii, the triumphal arch to one Slavia Posthuma Sergii whose family aided Augustus in the 31 AD Battle of Actium, when he defeated Mark Anthony and Cleopatra. The gate was once considered so magnificent it appeared in the sketchbooks of both Michelangelo and 17th century British architect, Inigo Jones. Now it opens up onto the Café Uliks. (Uliks is Croatian for Ulysses). A bronze statue of James Joyce sits at one of the café tables. In 1904, Joyce was paid £2 a week from the Berlitz school near here to teach English to Austro Hungarian naval officers. Although the Croatians of Pula might celebrate his time here, he actually hated the place, calling it naval Siberia. He left after only 5 months. Somehow we ended up on a small road out of Pula and after about 10km or so we drove into the town of Vodnjan (Dignano in Italian). Inside the 18th-century Church of St Blaise (sveti Blaž) are the ‘mummies’ of centuries-old saints, whose bodies mysteriously failed to decompose, are considered to have magical powers. It’s a mummy bonanza. There are 6 complete mummified corpses stacked in boxes like display items in a department store. But that’s not all. 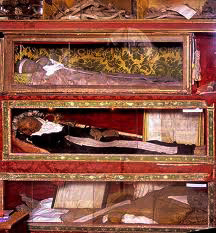 Nearby are hundreds of mummified parts of other great Saints, like the heel of Santa Barbara, and the preserved tongue of Saint Mary of Egypt, a prostitute who after visiting the grave of Christ, repented her life, using the same tongue to convert so many others. For those looking for the truly famous, there is the torso of the 3rd century St Sebastian, without the arrows in his chest, but complete with the leathered remains of arteries and veins, looking like a mixture of polished wood and molded leather. 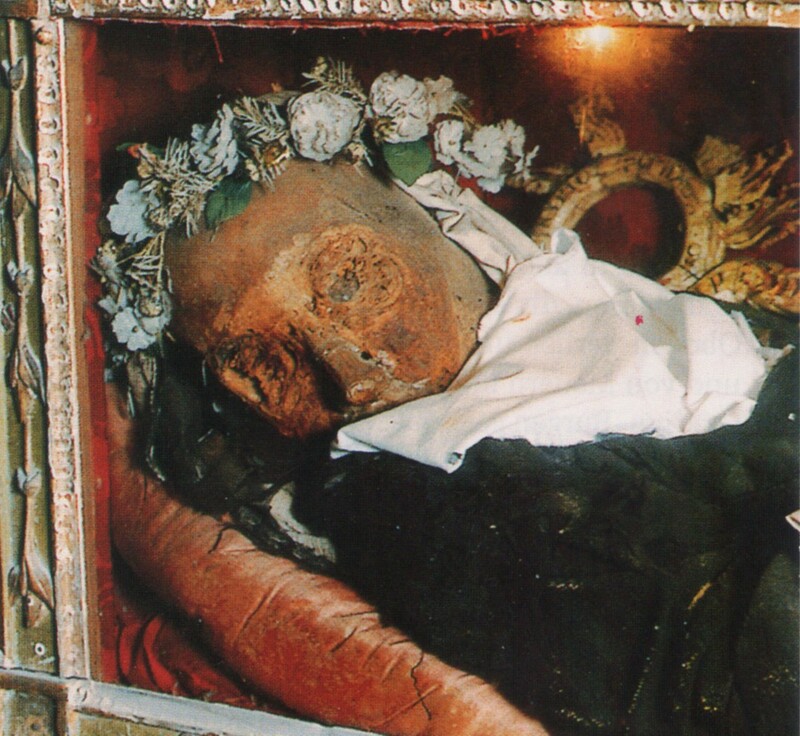 St. Leon Bembo died in 1188 but when he was exhumed a hundred years later he was still in pretty good condition. The same condition he’s in today. St. Ivan John Olini died in 1300 after he cured thousands from a plague. Even after he died people were cured of diseased just from sitting on his grave. Saint Nicolosa Bursa died in 1512, on April 24th, the day she predicted she would die. When they opened her grave supposedly a pleasant odor came out of the tomb. Making the story even more incredible, supposedly she was left in the open air for 163 yrs and still didn’t decompose. Her mummy is considered the best preserved corpse in Europe. Bioenergy healers have proved that the body of Nicolosa Bursa emits a 32-meter bioenergy circle. It is also said that there have been 50 miraculous healings in the body’s close proximity. As they will tell you, this is one powerful room of magical mummies. All of these treasures were scooped up by an artist named Gaetano Gresler and stored away in a safe house when Napoleon came into Venice and Croatia. In 1818, he brought them to this little church of St Blaise and they’ve been here ever since. We just found it very odd that none of the larger (more famous) churches or cathedrals would have petitioned for the relocation of these miraculous relics to more pilgrim friendly locations. Heading back north we stopped in Rovinj (pronounced Roveen). It was a fortress island city built under Venice rule but by the time the Habsburgs took it in the 1700’s they connected the island to the mainland for easier access. These days its hard to tell if it every was an island. It’s another beautiful small city with winding streets and lots of arts and crafts shops, souvenirs and cafes by the water. It has the look and feel of Venice, Prague and a ton of other small beautiful cities we’re been to along the way. The main square Trg Marsala Tita (named after Marshall Tito) is the spot to watch people and watch the harbor. Its also where most of the thousands for tourists congregate. After a walk up the very slippery marble steps of the old streets is the Baroque Church of St Euphemia. According to Christian lore, Euphemia (the patron saint of Rovinj) was thrown to the lions in Constantinople in 304 for denouncing the pagan gods of Emperor Diocletian. Fast forward 500 years later to July 13, 800 when the stone sarcophagus of Euphemia mysteriously washed up on Rovinj’s shore and was hauled up to the land by a small boy and a team of oxen. Euphemia (and the sarcophagus) are now interred inside the cathedral. You really have to admire the great lengths that the church pushed the leap of faith. The could have just gone 40 km down to the road to Vodjan and grabbed a magic mummy. 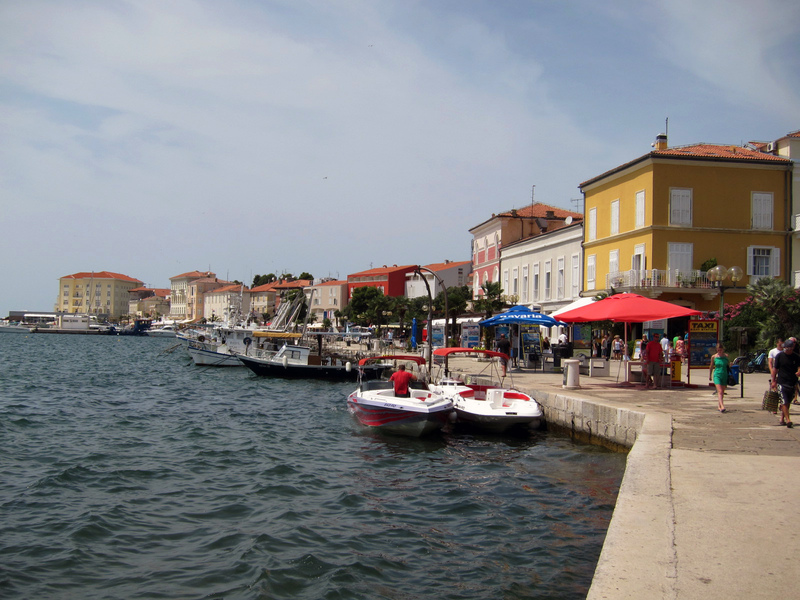 Porec is on the westside of the heart shaped Istrian Peninsula. Opatija on the eastside. Inland Istria is truffle country and in late September thousands of truffle hunters with thousands of truffle hunting dogs invade the woods. In 1999, a man named Giancarlo Zigante and his dog Diana rooted out a 1.3kg (about 2 ¾ pound) truffle. It’s still regarded as the largest in the world. Zigante now calls himself the truffle king with a slew of Zigante Truffle restaurants around the world. Opatija was one of the grand resorts of the old Austrian Riviera, founded as a holiday resort by the railroad entrepreneur Friedrich Julius Schuller in 1844. The resort was an immediate success and has been a magnet for tourists ever since. And why not. It’s a perfect location, mountains gently sloping into the sea, sheltered from the really nasty and cold “bura” winds that freeze the pants off of the rest of the Kvarner Region of the Istrian peninsula. In the late 19th century, this was the place to see and be seen, especially after Emperor Franz Joseph started to vacation here. 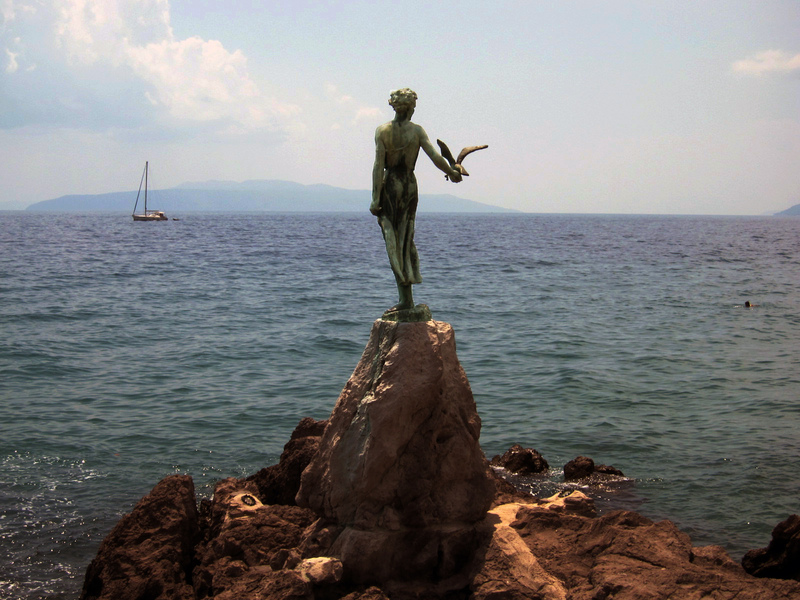 By the early 20th century Opatija was hosting the likes of the empress Elisabeth (Sissy) of Austria, Gustav Mahler , Anton Chekov, Isadora Duncan, Sigmund Freud, Giacomo Puccini, James Joyce and lots more. There is still an air of old world resort charm, with lots of old Viennese Recession villas climbing up the hillside from the harbor. 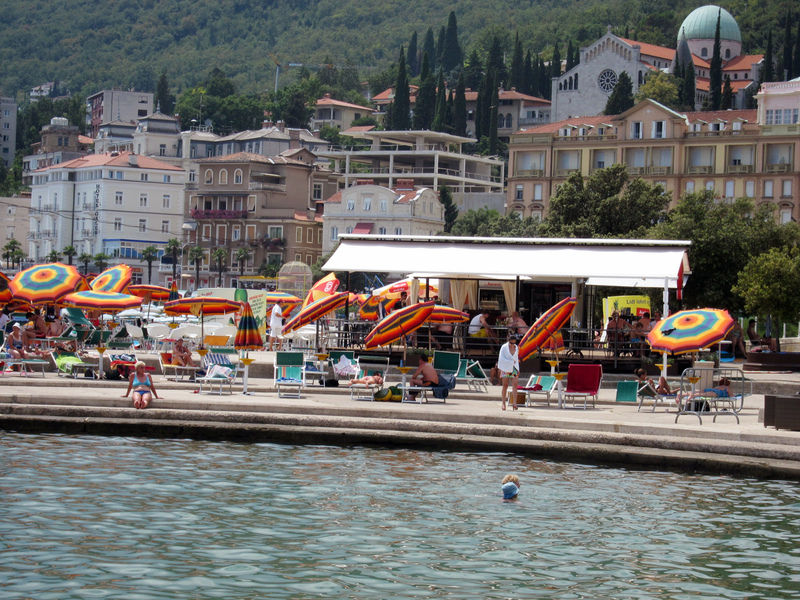 In the early 19th century Opatija was on par with Nice, Cannes and Biarritz as a health resort spa destination. On the night we arrived we saw many of the townsfolk dressing up in their favorite turn of the century costumes for Kaisernacht celebration, recalling those good old days when Opatija was under the thumb of the Austro Hungarian empire. The big activity, as it has been for years, is to walk the Lungomare promenade, a 12km seaside stroll that was completed in 1889 as part of the spa and recuperation resort activities. It’s a meandering stroll past Hotels and cafes, restaurants and shops, through flowering parks and alongside sunbathers. There is no actual beach in the town. Some of the seaside cafes imported sand to make them seem more beachlike, but there is no local sand. It’s all rock. 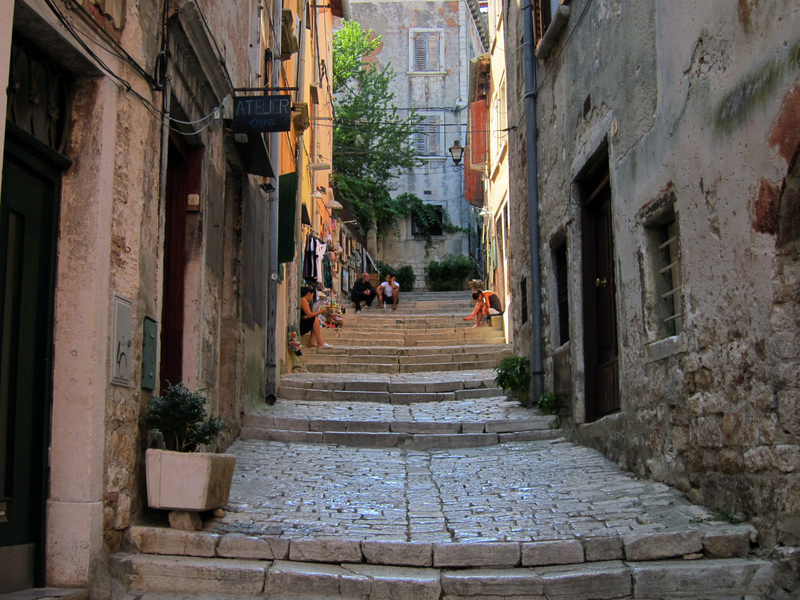 The seaside promenade has been paved with concrete and graceful steps carry you down into the Adriatic sea. It actually looks like a giant swimming pool with waves. We had a great night, another upgraded room to a suite, a delicious meal of stuffed grilled calmari and in the morning we were off to Split to catch the Ferry to Korcula Island in Southern Dalmatia, very close to the Peljesac Peninsula, the heart of the Plavic Mali red wine district.